Hi, I was inspired to make this card for a few of challenges. Nessa at The Crafty Laydee is challenging us to create a frugal christmas card without using products designed for christmas. I've used my Spellbinders dies, Stately embossing folder, snippets of designer paper and some sparkly silver ribbon. You are allowed to use a christmas sentiment! Snippets means I can pop in again to the playground at Pixies Crafty Workshop. Crafting with Dragonflies has a Use Your Scrap challenge. You need to use at least 5 pieces of designer paper on your project. My sister gave me these A4 sheets of silver embossed dp some years ago. I've slowly been using them up and am glad to use up some of the scraps! Crafty Hazlenut's Christmas Challenge Extra has an anything goes as long as it's christmas challenge for the month of September. Simon Says Stamp Wednesday Challenge has an Anything Goes theme. 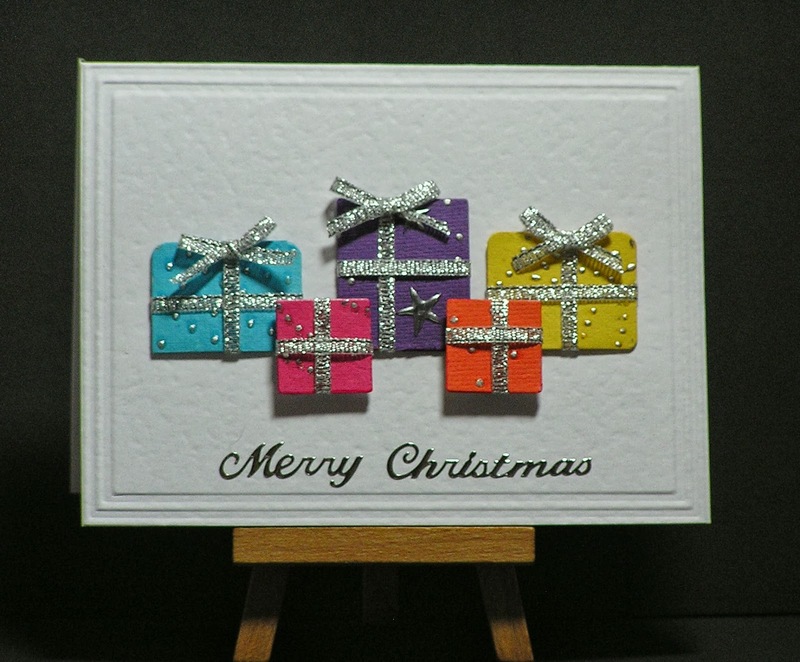 Inspired by Stamping has a holiday theme. I like that a lot. So simple but oh so effective. Beautiful card Cathy-What a great idea! I love the pop of the coloured presents against the white background-looks fabby! Wht a brilliant idea Cathy, I love it - lots of Christmas presents. BRILLIANT idea Cathy! And such a great impact against the white background too. Well done on both being frugal and of course using up more snippets. Like your pile of prezzies. They look very festive indeed. Just shows what can be done with just a few items. Hugs Mrs A. What a fun and beautiful holiday card! Love the little presents. Thanks for joining us at IBS! Love those colorful presents with the sparkly ribbon! Great card. I am envious of your dexterity with the fiddly ribbon bows you have here - they look so good. Thanks for sharing this with us at Crafting with Dragonflies. So festive and fun! Thanks for joining us at IBS. This is SO totally adorable! I love your little gifts! Thanks so much for playing along with us over on the Simon Says Stamp Wednesday Challenge ! 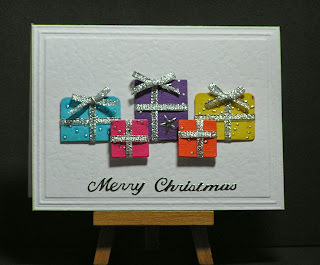 what a gorgeous snippet card, Cathy! A great idea! Such pretty presents and a perfect way to use up some snippets! This would work well for a birthday card too!